My best buy info is at the homeschool buyers Co-op. The price is $49.95. Regular price is $150.00, so you can see that this is a good deal. You get one student and one teacher subscription. Additional student subscriptions are available for $25. There is automatic scoring and you can log on as the teacher and see how your student is doing. You really do not have to do much, but the program is so much fun you may want to do it too. 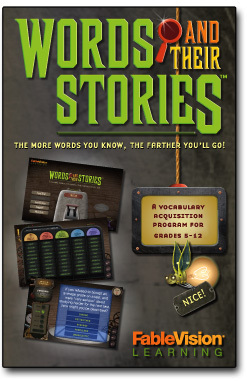 Grades 5 - 12 Learn over 1000 words.